A clean, sanitary foam, ideal for removing dirt, paint, ink, carbon, grease, grime, etc., etc. without the need for water. Contains Aloe Vera and Lanolin to condition and restore moisture to dried-out skin. 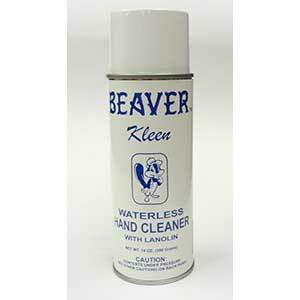 Beaver Kleen is a mobile one step, very effective, cleaning system which eliminates rinsing and drying. Saves time at the sink, in the field and while on the go, on the job.